Since the Horn of Africa drought of 2011 aid agencies have been working to understand the changes taking place in the drylands, hoping to better anticipate people’s needs. Recent research shows these changes go beyond climate and environment to encompass social and economic factors. The findings have important policy implications. “The predominant narrative of what these people want to do with their lives is a traditional, pastoral one, where their lives focus on raising animals and continuing in a tradition of pastoral transhumance little changed over centuries,” notes Changes in the arid lands: the expanding rangeland, a joint report by the Red Cross, Oxfam and Save the Children. 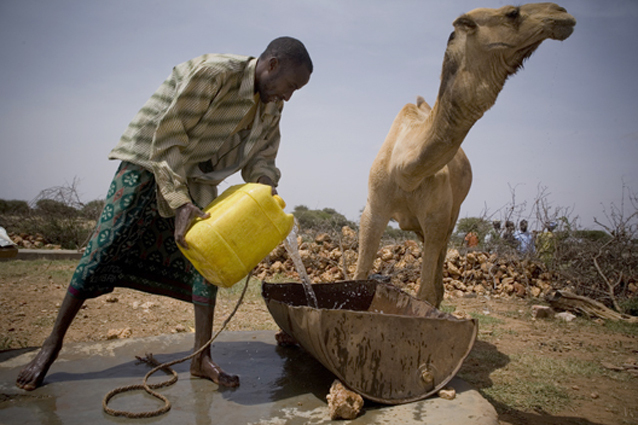 External factors, such as drought, have been used to explain pastoralists’ movement from nomadic livestock keeping to living in settlements and peri-urban areas. But this explanation ignores the rapidly changing socio-economic circumstances in these communities, the report says. Researchers asked communities in Shinile and Jijiga in Ethiopia, Togdheer in the self-declared republic of Somaliland, and Turkana, Kenya, what they want for the future. “Across the board, education was listed as the number one method to reach one’s aspirations; either for the interviewees themselves or for their children and grandchildren. Parents - no matter where they live - hope for their children to be educated and to get jobs,” stated the report. The report also found that youths and children, including those from pastoral settlements, were eager for professional futures, with the more settled and urban people interested in commerce. Women were also increasingly taking on professional careers or managing businesses, moving away from their traditional roles as caretakers of the home and family. Still, livestock remains important, with families expecting “to continue to exploit both traditional and non-traditional opportunities”. In Turkana, however, many interviewees felt that a better future was one without livestock. Under recurrent droughts and a decline in the numbers of livestock, Turkana residents have increasingly looked to diversify their livelihoods. In Kenya, long-marginalized arid regions are now moving closer to the centre stage of planning and development. Kenya’s Vision 2030 national development plan, published in 2007, already saw the historically marginalized drylands as the “new frontier” for development, notes a working paper by the Future Agricultures Consortium. "Many, especially young people, do not want to be limited in their life choices to living from pastoralism, and there is no reason why they should have no other choices"
The Lamu Port and Southern Sudan-Ethiopia Transport Corridor (LAPSSET) project, Kenya’s flagship project under Vision 2030, is opening up the arid northern region. LAPSSET plans include: a port in Lamu; a 1,500km standard-gauge railway line from Lamu to Nakodok, along the Kenya and South Sudan border; oil pipelines to South Sudan and Ethiopia; an oil refinery; three airports; and three tourist resorts. But according to experts, while LAPSSET could generate wealth and opportunities, it could also pose risks to the environment and to local communities’ rights and livelihoods. Pastoralists are concerned that the 200m-wide LAPSSET transport corridor will obstruct vital livestock migratory routes, and local leaders in Lamu are demanding a share of proceeds once the port is completed. The project has been criticized for insufficient consultation with communities. Locals have agitated for access to the benefits of other development projects, as well. In Turkana, residents have staged demonstrations to demand more jobs in the burgeoning oil sector. Current policies and legislation in the Horn of Africa offer mixed support for drylands communities, according to a 2013 report on integrated planning in the drylands of Kenya, Ethiopia and Uganda. “Though the principles for integrated planning are supported - participation of communities (land users) and other stakeholders, rights to information and knowledge, rights not to be removed from one’s land without compensation, equitable development - in practice, many policies and legislation fall far short of fully supporting drylands, the production systems that work there, and the communities that depend upon them,” the report says. Ending the regions’ marginalization could tackle some of the challenges. “The level of services which they receive is all too often lamentable. Services need to be given in accordance with the needs of the people. So where people live from pastoralism, investment is needed in services related to this kind of livestock keeping,” Simon Levine, a research fellow with the Humanitarian Policy Group (HPG), told IRIN in an email. These services include investment in areas such as animal health services. "Where people live from pastoralism, investment is needed in services related to this kind of livestock keeping"
Land tenure security also is essential, with “land grabs” being an ongoing concern. “Ending marginalization also means giving the people in the arid lands equivalent rights to land as those enjoyed by other citizens. Granting land rights does not mean that no investment is ever possible - it simply means that the people with rights have to have their interests considered and, if necessary, compensated for loss,” he added. Investment in the drylands should also not be restricted to livestock keeping. “Many, especially young people, do not want to be limited in their life choices to living from pastoralism, and there is no reason why they should have no other choices. This means a massive transformation of the education services, which are, for the most part, very, very poor in arid lands. It also means an investment in other economic infrastructure,” he said. In Kenya, communities in the drylands are looking to government devolution to push their development agenda. “However, the pastoralists’ voices can only be heard if their traditional management structure gets consulted,” Marko Lesukat, the Eastern and Southern Africa disaster risk management manager for Plan International, told IRIN in an email. “The worry I have is the land (for grazing, water, heritage and belonging)," Lesukat added urging the central government to heed drylands concerns to mitigate conflict.